Accepted Scientific Name: Rebutia minuscula K.Schum. The blooms are usually bright orange-red, but yellow flowering variant are often found in cultivation. Origin and Habitat: Salta, Argentina. Rebutia chrysacantha var. elegans (Backeb.) Backeb. Rebutia xanthocarpa var. elegans Backeb. Rebutia senilis var. kesselringiana Bewer. Rebutia senilis var. schieliana Bewer. Rebutia minuscula subs. edeltraudianae n.n. Rebutia senilis var. aurescens Backeb. Rebutia senilis var. lilacino-rosea Backeb. Rebutia senilis var. lilacinorosea Backeb. Rebutia senilis var. semperflorens Poind. Rebutia senilis var. stuemeri Backeb. Rebutia senilis var. stuemeriana Backeb. Rebutia violaciflora var. albispina hort. 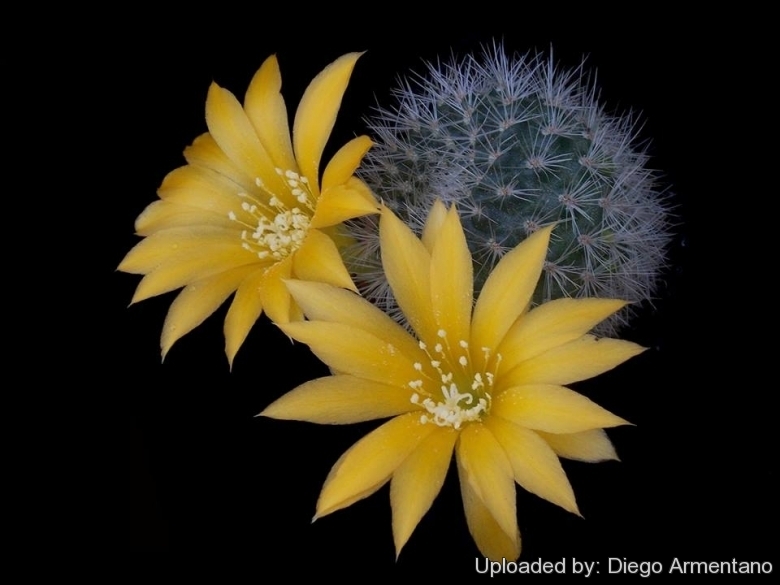 Description: Rebutia senilis var. iseliniana ( Occasionally misspelled "iseliana" or even "ischeliana") is a superfluous or questionable name, first published in 1946 by Krainz. This controversial “variety” is somewhat similar and not easy to tell apart from standard Rebutia senilis if not for the bright orange or orange-red flowers and thinner spines, sometimes pure white, often with a yellowish cast. The plants clump naturally and are very floriferous and attractive. Yellow flowering specimens are also frequent in cultivation. Regrettably most plants in cultivation under the name Rebutia senilis var. iseliniana seldom match up to the original description, being usually raised from commercial seed which have often been wrongly identified. Taxonomy notes: It is very difficult to distinguish Rebutia chrysacantha from Rebutia senilis var. iseliniana if guided by the description given by Backeberg for Rebutia chrysacantha (Kaktus-ABC, p. 276/277), for it could apply equally well to that of the senilis variety, especially when the latter develops yellow spines as it does when grown slowly in full sun. The flowers of the two plants are very similar, and differ only in shade. Probably Rebutia chrysacantha var. kesselringiana could also be included here. On the other hand both Rebutia chrysacantha and Rebutia chrysacantha var. kesselringiana are to be diagnosed as varieties of Rebutia senilis, suggesting that there is not really a fundamental difference between them. Recently Rebutia senilis var. iseliniana has been included within Rebutia minuscula (Anderson, 2001). Stem: Same as Rebutia senilis. Small, flattened-globular to spherical. Spines: Hair-like, very fine, more loosely arranged than those of Rebutia senilis, pure white, often with a yellowish tone. Flowers: Usually large, about 40-50 mm long and 40 mm wide, exclusively from the base of the stem c. 3-4 mm above the the surface of the ground (like in Rebutia chrysacantha). Buds red, with pointed scales paler towards the tips. Outer perianth segments light orange to orange-red inner perianth segments 14-17, 20-25 mm long, 7-8 mm wide, lanceolate, usually bright orange-red (occasionally yellow), with or without a darker mid-strip, and often with a brown throat, outside often with purple gloss. Ovary c. 4 mm in diameter, with pale orange to greenish-brown scales. Tube slender yellow-orange. Pistil white to yellow-white. Stigma white, with 5-7 thin stigma lobes, above the anthers. Filaments bright yellow, anthers creamy-yellow. Mostly self-fertile. Fruits: Spherical, 5-7 mm diameter, yellow-orange, with red-green-scales (like in Rebutia chrysacantha), at times with a few bristles. Seeds: Rough but shiny black, about 1 mm long. Rebutia chrysacantha Backeb. : This name is applied to plants with stiffer spines, yellowish with brown tips, and with reddish-orange flowers. Rebutia chrysacantha var. elegans (Backeb.) Backeb. : has stiff whitish spines and reddish-orange flowers. The name is derived from the overall appearance of the variety, with elegant, neat, spines spirally arranged. Rebutia minuscula subs. edeltraudianae n.n. : has yellow-orange flowers (= Rebutia xanthocarpa). Distribution: Sierra Medina, Tucuman, Argentina. Rebutia minuscula f. kariusiana (Wessner) Donald: has pink-violet flowers and shows transitional characters between Rebutia minuscula subs. violaciflora and Rebutia wessneriana subs. beryllioides. Rebutia senilis Backeb. : has bristly, glassy, white spines up to 30 mm long that largely covers the stems and very showy orange or crimson blooms. Distribution: Salta, Argentina. Rebutia senilis var. iseliniana Krainz: has bright orange or orange-red (occasionally yellow) flowers and thinner spines, sometimes pure white, often with a yellowish cast. Rebutia senilis var. lilacino-rosea Backeb. : has pink-violet flowers that distinguishes it from other varieties of Rebutia senilis. Rebutia violaciflora Backeb. : has light-violet blossoms in the early spring. It is a selected colour strain. Rebutia violaciflora var. albispina hort. : has pink-violet flowers and glassy-white spines intermediate between the short, spines of Rebutia minuscula and the long spines of Rebutia senilis. Cultivation and Propagation: Rebutia senilis var. iseliniana comes from mountainous areas, so like bright light, and cool and dry conditions in the winter. The whole Rebutia minuscula complex has delightful flowers and the plants remain compact, and clumps can easily be managed by division. It is easy to cultivate and recommended for beginners. Propagation: Offsets, seeds. Seeds germinate in 7-14 days at 21-27° C in spring or summer remove gradually the glass cover as soon the plants will be well rooted (ca 1-2 weeks) and keep ventilated, no full sun for young plants! The seedlings should not be disturbed until they are well rooted, after which they can be planted separately in small pots. To make a cutting twist off a branch and permit it to dry out a couple of weeks, lay it on the soil and insert the stem end partially into the soil. Try to keep the cutting somewhat upright so that the roots are able to grow downward.